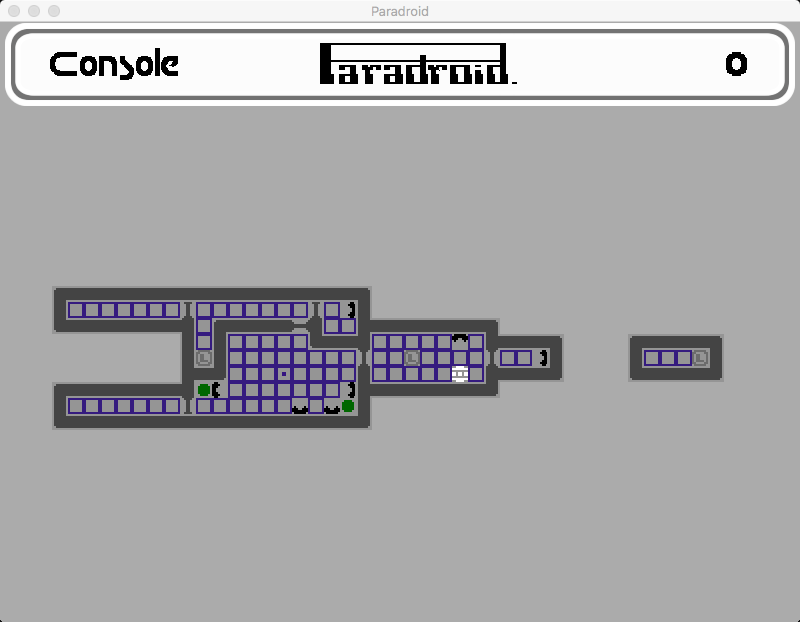 This blog will be all about the Console areas of Paradroid, which were accessed within the main game as a kind of sub-computer for information about what you were dealing with. This is quite a big part of the game that I “missed” – as in didn’t really take much notice of – when I first played back in the Eighties. Back then I usually went around just trying to kill all of the droids, or perhaps trying to take them over one by one using the transfer game. Neither of these tactics worked very well and I don’t recall ever completing one dreadnaught. Inside the console is a wealth of information that was pretty-much wasted on me in my youth. When I returned to the game, while thinking about this remake, I started to see all the effort that Andrew Braybrook actually put into this game, and it still amazes me how he managed to cram it all into a Commodore 64’s memory. The amount of information information in the console alone, never mind the game, is actually staggering. Firstly, the minimaps section of the console was a no-brainer for using tilemaps – especially as the decks themselves have already been created the same way. I started playing through the game by traveling to all the decks and looking at all the minimaps for each one. After a while it became obvious that not only do the charging-stations have animations, but also the location of the player. I also noted that Andrew must have struggled to get the maps in such a small area that the game is played in as this can be seen in the main image at the top and the image below. I am sure they’re not as neat as he probably wanted at the time. One of the largest decks filling the displayable area. 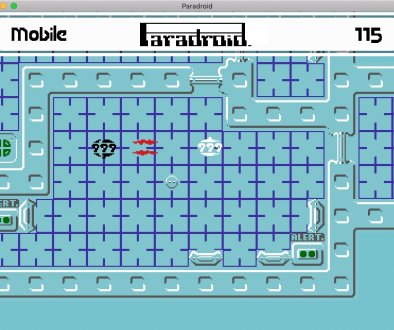 My first thought was to recreate each level as its easy enough with Gamemaker, but a little labour intensive. However, I already had the game maps allsetupp, so all I really needed was to create a tilemap that was identical to the main games tiles, but using the smaller simple minimap styled graphics. This got me thinking about the original decks that we had back in the Tiles, Tiles, they‘re everywhere post. After a bit of rearranging of the decks so that I could identify with some starting and ending X,Y coordinates, I had the size of the map in tiles and the players position on that deck. With that it made calculations of what deck the player is on easy. This way I was able to write a routine to create the mini-map of the original map data using smaller graphics and lay down an accurate small view. 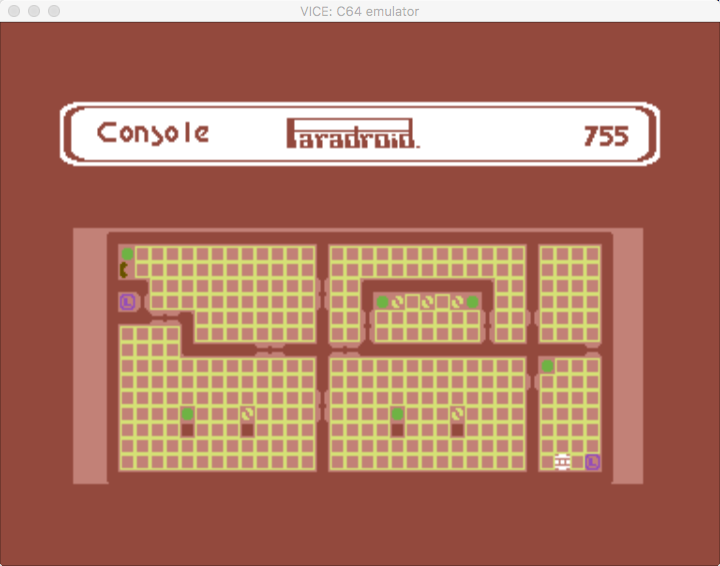 A nice design idea here could possibly be overlaying that as a kind of radar elsewhere on the screen as a kind of guide, but the original Paradroid never had that, so no. As you can see in the image above I now have two decks nice and tidy next to each other – with a big enough gap so that you can’t see one from the other if you hugged a corner to scroll the screen as far as possible. I then set up an area in the games room where I could dynamically draw the minimaps. Here is the area in game where the maps get created. I have used the title screen logo for a bit of fun as well as using the small squares to work out how many tiles I could actually use so that all the decks were convertible. This is staying in the game but won’t be seen, as the area is cleared each time a map is drawn. 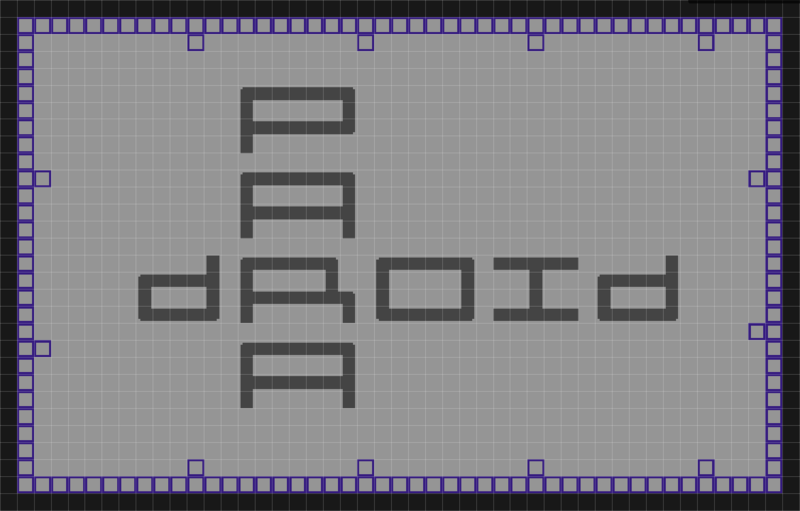 Once I had the area mapped out and knew the target tilemaps height and width, a quick calculation of the height and width of the target map against the decks height and width would give me my padding areas for the top and left. I could then loop around the deck copying in the tile numbers from the deck map to the corresponding minimap version to get the perfect recreation. Additionally, while in this loop, I will find the player and put an animated tile in the correct location. Below are a couple of small videos that show the minimaps animating and changing colours.